Is your computer cluttered with suspicious programs that feature ads and pop-ups but don’t really do what they promise? Or maybe you installed to many so called „free” apps that also push browser toolbars and other adware add-ons onto your system? Bitdefender Adware Removal Tool is a handy, free utility that detects adware and malicious hijacker apps that are installed on your computer as well as toolbars and other types of browser add-ons. The tool finds all malicious and adware apps installed onto your system and shows them to you in a list, ready to be removed. 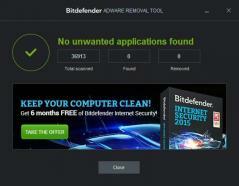 With Bitdefender Adware Removal Tool it’s incredibly easy to clean your computer of adware and other types of malicious apps and browser add-ons!